Hello kiddies and welcome to another ride on the rollercoaster of life, the coaster that even with proof, we will deny. This time lets look at Giants, Giants in our past. REAL? FAKE? You be the JUDGE! 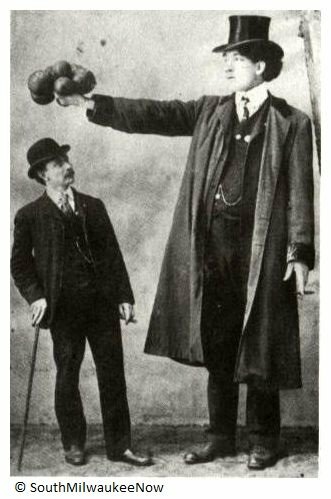 The mythology and legends of many different cultures include monsters of human appearance but prodigious size and strength. 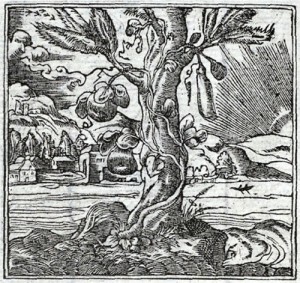 “Giant” is the English word (coined 1297) commonly used for such beings, derived from one of the most famed examples: the gigantes (Greek “γίγαντες”) of Greek mythology. 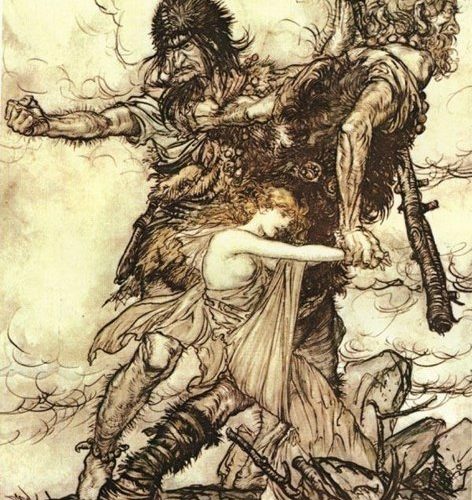 In various Indo-European mythologies, gigantic peoples are featured as primeval creatures associated with chaos and the wild nature, and they are frequently in conflict with the gods, be they Olympian, Nartian, Hindu or Norse. In Japanese folklore, Gashadokuro, (がしゃどくろ) also known as Odokuro, or (“starving skeleton”) are giant skeletons that are fifteen times taller than an average person. If a Gashadokuro sees a human, it will grab it and attempt to bite its head off with its giant teeth. 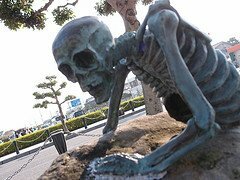 Gashadokuro are created from gathering bones from people who have died of starvation. The only way a Gashadokuro can be detected before it appears is by hearing a ringing in one’s ears. People who are being targeted by this mammoth- sized skeleton hear extremely loud bells ringing throughout their ears. Gashadokuro targets people when they are alone. It roams about after midnight. 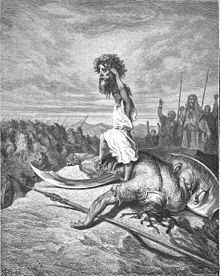 There are also accounts of giants in the Old Testament, most famously David and Goliath. There are stories from every continent, every culture, every nation, every religion. Legends and myths of the Giants, attributed to them are extraordinary strength and physical proportions. In many places in the United States these giants have been found as skeletons buried in graves thousands of years ago. A number of giant human skeletons are unearthed by the Smithsonian at the South Charleston, West Virginia mound complex. 8-10 foot giant human skeletons found in Arkansas burial mound. The remains of 3 large ancient skeletons estimated at ten foot in length discovered in Missouri. Their heights ranged between 7.6ft and 10 feet and their skulls “presumably those of men, are much larger than the heads of any race which inhabit America to-day.” They tend to have a double row of teeth, 6 fingers, 6 toes and like humans came in different races. The teeth in the front of the jaw are regular molars. Heads usually found are elongated believed due to longer than normal life span. On 10 August 1891, the New York Times reported that scientists from the Smithsonian Institutionhad discovered several large “pyramidal monuments” on Lake Mills, near Madison, Wisconsin. “Madison was in ancient days the centre of a teeming population numbering not less than 200,000,” the Times said. The excavators found an elaborate system of defensive works which they namedFort Aztalan. Giant skulls and skeletons of a race of “Goliaths” have been found on a very regular basis throughout the Midwestern states for more than 100 years. Giants have been found in Minnesota, Iowa, Illinois, Ohio, Kentucky and New York, and their burial sites are similar to the well-known mounds of the Mound Builder people. The spectrum of Mound builder history spans a period of more than 5,000 years (from 3400 BCE to the 16th CE), a period greater than the history of Ancient Egypt and all of its dynasties. Okay kiddies our you numb yet ? Ancient Giants existed and here is the proof. One of the best Documentaries. Giant Human Skeletons Found in Greece! Well I think there is something going on. Why would this not be news. well here is a story to make you think. The skeletons of some Mound Builders are certainly on display. There is a wonderful exhibit, for example, at the Aztalan State Park where one may see the skeleton of a “Princess of Aztalan” in the museum. But the skeletons placed on display are normal-sized, and according to some sources, the skeletons of giants have been covered up. I meet a leader in the archaeology world who told me that there is so much stuff that is hidden, because it doesnt fit what those in power WANT for history. So its up to you what will be done. Keep the lies or buy the BULL!